A Religious “Handbook” that Works? There is one very simple Scientology book that happens to be online in a shortened version, and which literally anyone can benefit from bookmarking and using frequently. It’s the Scientology Handbook. It’s based on the works of L. Ron Hubbard and its name is really appropriate. And the Scientology Handbook gives you plenty to do. Here just one example of how anyone can use the book or the web site (you don’t have to be a Scientologist to use it). A friend is in an abusive relationship. As is so often the case, she feels it’s her own fault. She thinks if she just tries a little harder she can help him. Sure he’s an alcoholic, but that’s why he acts the way he does–he really loves her.” You’re worried because she is showing up more frequently with black and blue marks. Maybe she even “broke her arm” because of an “accident” recently. You have tried to reason with her but it doesn’t work. You are close to giving up entirely, but you are really worried about her. When you have tried to communicate with her, it has gone nowhere, and now she’s even avoiding you. 2. Once you can talk to her how to you get her to see this!? So. 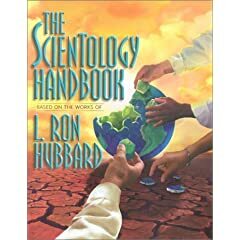 The first thing is go to the chapter in the Scientology Handbook components of understanding. This chapter gives a very precise and effective drill on how you can patch up and improve your communication with anyone. 2. Now, study the chapter on the Ups and Downs of Life so you understand what an antisocial personality is yourself. Once you have understood this, get your friend’s agreement to read the chapter and do the drill of evaluating her boyfriend against the characteristics listed. You may be very surprised how effective these two chapters will be in helping you help her help herself! This entry was posted in L. Ron Hubbard, Scientologist, scientology, Scientology Handbook. Bookmark the permalink.